Using your existing pool pump, pool water is directed through a series of valves to the solar panels. As the water rises through the solar panels it is heated by the sun’s radiant energy. The water then returns to the swimming pool to repeat the cycle until the pool has reached your desired temperature. What are the benefits of using solar heating for pools? The primary benefit of using solar energy to heat your pool is a financial one: in the medium and long term, it’s much cheaper. You’ll also get more use out of your pool as your swim season will double in length; and the system is easy to use and maintain. Solar heating for pools is an environmentally responsible choice too, and that alone is considered a huge benefit by many of our customers. What does solar pool heating cost compared to other types of pool heaters? A solar pool heating system is the only heater that eliminates expensive pool heating utility bills. Natural gas and propane heaters are less expensive to install initially but have a significantly higher operating cost. Oil heaters and electric heat pumps cost about the same upfront as solar. View a pool heater cost comparison chart here. Where is the solar pool heating system installed? The solar collectors are typically mounted on roofs or any area near the pool that provides the proper exposure, orientation and tilt toward the sun. Heliocol systems can also be installed on the ground or on a custom built wood rack. No. East and west facing systems work well. We generally do not recommend a north facing system. Does solar swimming pool heating still work when it is cloudy outside? Yes. The heating system absorbs solar radiation which is present even during cloudy conditions. Any solar radiation absorbed by the Heliocol system is then transferred into the pool water. The system does not heat at night when the ambient air temperature is lower than 60 degrees, or when it is raining. What is involved in maintaining a solar swimming pool heating system? We recommend that you schedule Sunshine Solar to winterize your system at the end of each season. Winterizing is the only recommended maintenance. Can I use it with my existing fossil fuel pool heater? The Heliocol system is designed to serve as the only heater you need for your pool. However, some of our customers choose to use their solar heating system in conjunction with a conventional pool heater. The Heliocol solar heating system serves as the primary heat source with the conventional heater as a backup. Using the Heliocol system extends the life of a conventional heater while minimizing the utility bills. Will a roof-mounted heating system harm my roof? Sunshine Solar Technologies installs Heliocol solar pool heating panels which have a roof-friendly, patented, individual tube design. The individual tubes allow moisture to pass through the panels, while competing systems trap moisture and debris that can deteriorate the roof over time. Heliocol solar pool heating panels are secured with the patented Alligator Clamp that allows for normal expansion and contraction without applying pressure to the roof. Other manufacturers’ systems are secured with cumbersome and unattractive straps that can lead to roof damage. How is a solar pool heater different from a solar pool blanket? A solar swimming pool heating system generates heat for your pool while a pool blanket helps prevent heat loss. A pool blanket does not generate heat. Surface area evaporation is the biggest source of heat loss for pools, and pool covers are an inexpensive way to maximize the efficiency of any pool heating system. The combined use of a solar pool heater and pool blanket will most cost-effectively and efficiently heat your swimming pool. 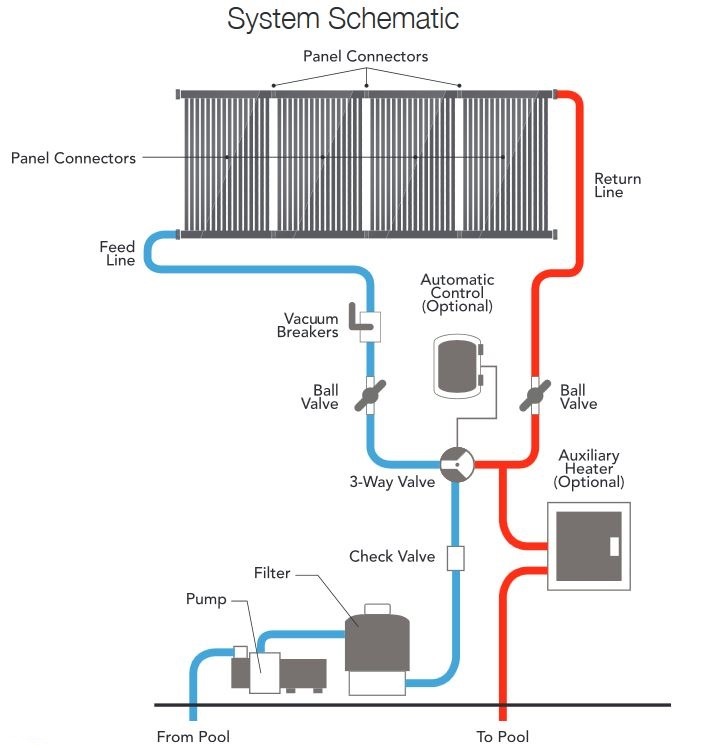 Can I use a domestic hot water solar system to heat my pool water? Not cost effectively. These solar technologies are designed for different applications. A solar domestic hot water system is designed to heat a small amount of water (typically 80 to 120 gallons) to high temperatures (typically 120 degrees or warmer) while a solar swimming pool heating system is designed to heat thousands of gallons of water to lower temperatures. Get started with a free pool heat analysis today!